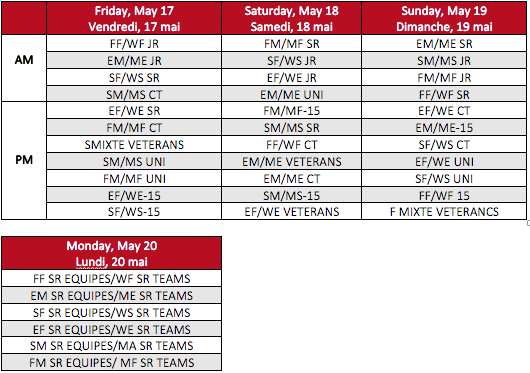 Organized by the Canadian Fencing Federation, in partnership with the Quebec Fencing Federation and the Estoc Fencing Club of Quebec. Registration closes Friday, April 26th, 2019, 11:59PM EST. April 27th to May 3rd double fees apply, May 4th to May 10th triple fees apply plus $200. *Exact start times along with the entries and seeding will be posted the week of April 29th following the close of registration. CFF MEMBERS MUST HOLD A NATIONAL CFF LICENCE NUMBER, VALIDATED BY THEIR PROVINCIAL ASSOCIATION. 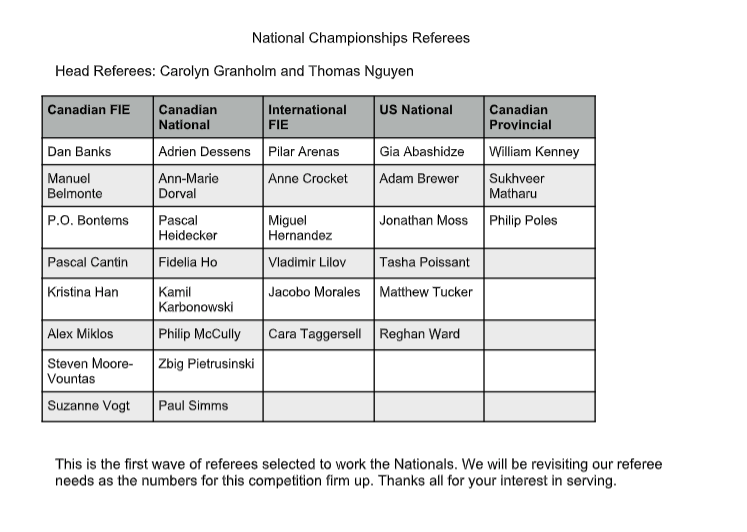 ONLY ATHLETES WHO ARE A CANADIAN CITIZEN OR A PERMANENT RESIDENT OF CANADA ARE ALLOWED TO ENTER CANADIAN CHAMPIONSHIPS. Teams can be formed by submitting a team roster at the event in advance of the team competition, or by simply registering individually, with teams populated using the Senior Individual rankings. Medals will be awarded to the top 3 teams with additional prizing awarded to the top team. Participation is strongly encouraged as the team event is a priority within the CFF High Performance Program and may be made mandatory in the future for HP Program athletes. On Saturday, May 18th, the Canadian Fencing Federation will host the 2019 Awards & Recognition Gala at the Hilton Quebec, Palais Room. This special event is dedicated to acknowledging and celebrating Canadians who have made a significant impact, nationally and internationally, to the sport of fencing. Dress Code: No dress code in effect.